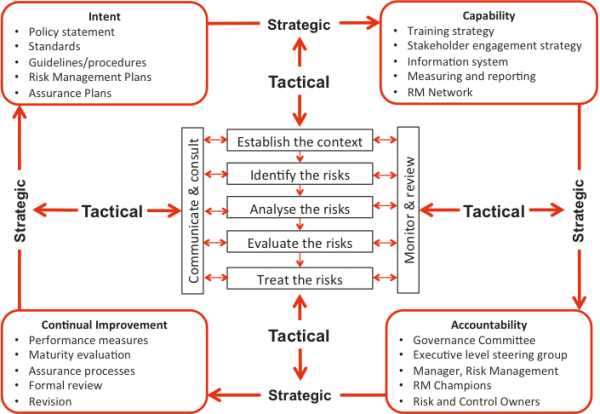 All organisations must deal with changes in the environments in which they operate. These may relate to changing stakeholder expectations, new strategies adopted by competitors, emerging technologies, changes in staff, availability of finance and the requirements of new legislation. Change is inevitable; it is best dealt with proactively rather than reactively. Some potentially disruptive events, however, may exceed the capacity of routine management methods and structures. It is necessary to be ready for this by building contingent capacity into the management framework and by preparing contingency plans. This allows the organisation to change its mode of operations quickly, to help ensure business continuity despite the occurrence of a potentially disruptive event. Such contingent capacity and plans enable management to focus quickly on stabilising the situation and maintaining or resuming the most critical functions, while still working in a planned way towards eventual restoration of routine operations and full achievement of objectives. Maintaining business continuity is a core obligation of good governance. We assist organisations develop strategies for the effective management of disruptions and thereby enhance their resilience. This also creates strategic and tactical advantage in uncertain and volatile environments.